The Hillsboro Indians and Lady Indians Track and Field teams pose for a picture with their first place trophies from the RL Davisson Invitational at Southeastern High School on Thursday. Hillsboro’s Bailey Lucarello participates in the boys 4x800-meter relay race at Hillsboro High School on Tuesday, March 26, at the Indians first home meet of the 2019 Track and Field season. Lucarello took first place in the boys 3200-meter run on Tuesday, April 2, at Hillsboro High School where the Indians hosted McClain and Adena for a tri-meet. McClain’s Reece Schluep participates in the boys 800-meter run race at McClain High School on Tuesday, March 26, at the Indians first home meet of the 2019 Track and Field season. Schluep climed first place in the boys 800-meter run on Tuesday, April 2, at Hillsboro High School where the Tigers took part in a tri-meet with Hillsboro and Adena. 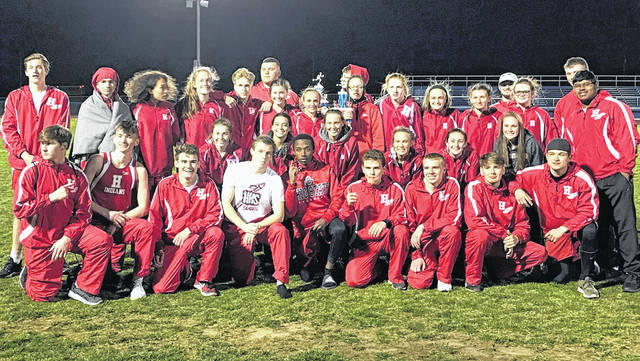 The Hillsboro and McClain boys and girls Track and Field teams participated in the RL Davisson Invitational on Thursday at Southeastern High School where the Indians and Tigers finished first and sixth in the boys team standings and the Lady Indians and Lady Tigers took first and second respectively at the event. Hillsboro earned the top spot in the boys’ standings with a team total of 122 points and McClain totaled 43 points in the team standings to earn its’ sixth place finish. The Lady Indians totaled 94 points to finish at the top of the girls’ team standings and the Lady Tigers tallied 84.50 points in the team standings to claim second place at the RL Davisson Invitational. Deon Burns and Draven Stodgel took home first and second place respectively in the boys shot put and had throws of 52-02 and 49-10 respectively. Hillsboro’s Sydney Callahan claimed third place in the girls long jump event with a distance of 15-02.50. Quinn Conlon matched his seed height of 5-08 in the boys high jump event and claimed first place in the event to net the Indians 10 points in the team standings. Cierra Lively finished second in the girls high jump event and cleared a height of 4-08. Stodgel took first place in the boys discus throw and completed a throw of 166-04 to earn 10 team points for the Indians. The Indians 4×400-meter relay team of Landon Weber, Conlon, Chris Stout and Ty Alexander finished in third place with a time of 3:48.35. Hillsboro’s Lady Indians claimed first in the girls 4×400-meter relay as the team of Eden Edenfield, Molly McCreary, Callahan and Jaeleight Hart finished with a time of 4:36.56. Bailey Lucarello claimed second place in the boys 3200-meter run and earned eight points for the Indians’ team total with a time of 10:59.17. Edenfield won the girls 200-meter dash with a 27.36 second time. Ty Alexander took home the top spot in the boys 800-meter run and finished with a time of 2:10.17. Alexander also finished in first place in the boys 400-meter dash with a time of 53.50 seconds. Conlon placed third in the boys 300-meter hurdles event with a time of 42.37 seconds and was third in the boys 110-meter hurdles with a time of 16.73 seconds. Lively was first in the girls 300-meter hurdles for the Lady Indians and finished with a time of 50.51 seconds. Hart and Callahan finished first and second respectively in the girls 400-meter dash with times of 1:05.55 and 1:06.51. Hillsboro boys 4×200-meter relay team of Tyler Workman, Anthony Richards, Kai Rickman and Alexander took first place in the boys event with a time of 1:37.54. Bre Karnes, Callahan, Edenfield and Hart made up the Lady Indians’ 4×200-meter relay team that took second place with a time of 1:55.51. Zoe Rios won the girls 100-meter hurdles for the Lady Tigers and finished with a time of 17.67 seconds. The Lady Tigers’ Kerigan Pollard won the girls 100-meter dash and Iva Easter finished in fourth place with respective times of 13.40 and 14.15 seconds. Pollard also took second place in the girls 300-meter hurdles with a time of 52.01 seconds. Patrick Fout of McClain took home third place in the boys 100-meter dash and finished with a time of 11.63 seconds. The McClain Lady Tigers 4×200-meter relay team took third place at the RL Davisson and the team that is composed of Arianna Cole, Lexi Jones, Ashley Hardesty and Easter finished with a time of 1:58.92. The girls 4×100-meter realy team from McClain finished in third place with a time of 55.49 seconds and consisted of Cole, Rios, Hardesty and Emma Stegbauer. The Tigers 4×100-meter relay team of Kobe Penwell, Fout, Trevor Newkirk and Colton Mossbarger took second place in the event with a time of 46.42 seconds. Pollard claimed second place in the girls 200-meter dash for the Lady Tigers with a finishing time of 27.47 seconds and she climed first place in the girls pole vault with a height of 8-09. Fout claimed third place in the boys 200-meter dash and finished with a time of 23.31 seconds. Zane Mustard took third place in the boys high jump event and cleared a height of 5-06. The boys and girls teams from Hillsboro and McClain also competed in a tri-meet with Adena on Tuesday at Hillsboro High School. The Indians finished first in the boys standings and the Tigers were second with team scores of 91 and 64 respectively. Results from the girls events at the tri-meet were not readily available for inclusion in this story. The Indians and Lady Indians will be back in action Tuesday, April 9, when they travel to Miami Trace High School to take on the Panthers and Lady Panthers. The Tigers and Lady Tigers will also be in action on Tuesday, April 9, when they host the Blue Lions and Lady Blue Lions of Washington High School. Hillsboro’s Bailey Lucarello participates in the boys 4×800-meter relay race at Hillsboro High School on Tuesday, March 26, at the Indians first home meet of the 2019 Track and Field season. 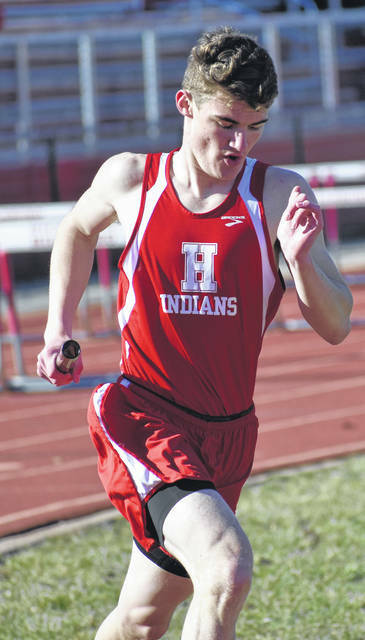 Lucarello took first place in the boys 3200-meter run on Tuesday, April 2, at Hillsboro High School where the Indians hosted McClain and Adena for a tri-meet.